Learn the skills every dealer needs to work at professional poker events such as the WSOP whilst on a salary of up to $100,000-a-year. In the poker world there are two types of people: those that play the cards and those that deal them. Divided by a padded rail and an expanse of felt, players and dealers move in tandem throughout the course of a session to create the sweet music that is poker. The former of the two often takes the spotlight while the latter blends into the background like a cog in a well-oiled machine. The fact is, one simply cannot live without the other. In fact, when it comes to any poker variant, whether it's Texas Hold'em or Pot Limit Omaha, poker dealers are an essential ingredient that cannot be overlooked. If you're not willing or able to become a poker pro, it doesn't mean the poker industry doesn't have something to offer. If you're a fan of poker then a job as a poker dealer could be the ideal career option. Aside from having the opportunity to travel the international tournament circuit and meet some of the top players in the world, proficient poker dealers can make a steady income (some earn as much as $100,000 in pay each year) regardless of how the cards fall. Is Poker Dealing for You? How Do You Become a Dealer? How Much Does a Poker Dealer Get Paid? The Positives & Negatives of Poker Dealing? Becoming a dealer is a great way to make a living from poker, but before you spend hours researching you'll want to make sure that it's the job for you. Being a poker dealer can be an extremely rewarding job, but to ensure you get the most out of the industry you'll want to make sure that you have the right skill set. From a practical perspective, there are very few formal qualifications you'll need to become a poker dealer. But, not everyone is suited for the life of a poker dealer, so it's important to recognise the abilities that will greatly help your development in this occupation. The ability to calculate bets and pots is an essential skill. A brilliant virtue at the poker table, especially with cautious players. Something that will greatly affect how much you enjoy working, as well as impacting how many tips you receive depending on your demeanor. Hand reading skills & an ability to determine hand rankings quickly is also a must. You don't have to be a world-class poker player to be a world-class poker dealer; however, if you have some prior knowledge of the game you'll find it a lot easier to learn the skills of the trade. If you've made it this far then a career as a poker dealer could be on the cards for you. So, read on to learn more about your opportunities in the world of dealers and their brilliant pay packages. As you've probably worked out, the path towards a career as a poker dealer is a varied one and things aren't any different when it comes to securing a job. If you were to talk to a selection of dealers at a casino, you would probably a selection of various different routes. The most popular way to become a poker dealer is to complete a 4-8 week training course and then apply for a vacant position at a land based casino. If you already have some experience in the industry (as a player or dealing home games), then you can visit your local casino and start to learn on the job. In both instances, you'll need to complete an "audition" which involves dealing a live game for 15-20 minutes while the poker room manager watches you. If you're not quite ready to deal with the complexities of aspects such as split pots and players on tilt, then some pre-job training is a must. An online search will bring up various training centers around the US, including The Casino Institute and the Mizrachi Dealer Academy. The former is recognized by casinos across the US and offers formal qualification on completion of a 12-week course that costs $1,800. The Mizrachi Dealer Academy was set up by poker pro Michael Mizrachi and offers diplomas certified by The Board of Education of Florida for Professional Poker Dealing. Through a combination of live and online training, prospective dealers can learn the skills world-class players like Mizrachi expect during a tournament. In addition to training, all poker dealers working in licensed US casinos will need a gaming license. This license is issued by a government agency and is only given after various background checks have been completed. In Las Vegas all casino employees, including poker dealers, must also have a Sheriff's card and other states will require a similar state gaming license in order to work legally. Before you take the plunge and decide to become a poker dealer, it's worth knowing what your employment prospects will be. It's one thing being able to make a good salary, but are there jobs for you? In the US, a well-qualified poker dealer will always be in demand and should be able to find work in a variety of casinos both as a tournament and cash game dealer. According to the Bureau of Labor Statistics (BLS), there were approximately 68,500 registered dealers in the US at the close of 2014 and the market is set to grow by around 0.4% to 68,900 by 2024. Additionally, over the next decade, the BLS estimates that around 19,000 job openings will be listed by casinos in the US in order to cover new positions and address replacement needs. Poker dealers fall into two main categories: cash game dealers and tournament dealers. Although you can choose to do both, opportunities for cash game dealers are often more stable than tournament openings due to the fact cash games run consistently inside a casino. However, if you're able to make a name for yourself on the tournament circuit with an organization such as the WSOP or EPT, you should be able to find regular work throughout the year. On top of the brilliant salary that you'll make there are a plethora of other benefits available to experience when you decide to move into the business of dealing. - The Social Aspect - Working in a lively casino environment breeds a feeling of comradery between dealers, as well as being able to converse and socialize with the players whilst they are at your table. - Lucrative Tips - Once you're trained up, you'll find the tips flow regularly. It's not uncommon for dealers to earn double what they're being paid per hour at a good table. - Flexible Hours - Often, casinos are thought of as having their staff work odd hours. But this allows you much more flexibility when it comes to needing time off. - Travel - Poker dealing is a skill that can be used at almost any casino, as long as you know a wide range of games, giving you the option to move around with the casino circuit. This question is like asking how long a piece of string is. The way that poker dealers are paid means determining the actual amount you can make isn't easy. However, at most casinos in the US you will receive minimum wage payments for the duration of your shift and, according to the BLS, the average mean salary for a poker dealer in 2011 was $21,930. This can change year on year depending on many factors from general economic growth to the popularity of land based casinos. Experience also plays an important part as it can lead to salary increases. In essence, poker dealers earn the bulk of their pay from tips and, like any service profession, the amount you're tipped is largely dependent on your attitude, your skills and the customer. Because of this it's difficult to determine how much you can make as a poker dealer; however, there are some general standards of etiquette which can help you get some idea of your potential EV. Most dealers will look to deal around 30 hands per hour and earn an average of $1 per hand, meaning it's possible to earn $30 per hour in tips. This figure is based on the fact that the average cash game player in a US casino will tip one small blind at low and mid stakes when the pot won is more than 10X the big blind. For example, in a $1/$2 game a player would tip $1 if they won a pot in excess of $20. If the pots are much larger or the stakes are higher, the tips will be adjusted accordingly. A high stakes player may tip $100 or more per hand. 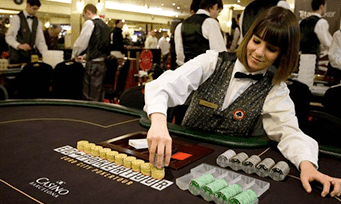 Additionally, if a player has earned a significant profit during their session (regardless of the stakes), they may also tip a proficient and friendly dealer when they leave the table. In high stakes cash games this could easily be $500+ if the player has won $100,000+. When it comes to tournaments, tips are handled in one of two ways: mandatory tips and personal tips. At low level local events it's usually the case that players who make the money (usually the winner) will give the tournament director a certain amount of money to be shared among the dealers. 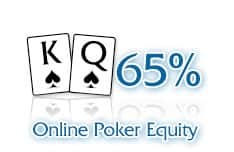 In contrast, at major events such as the WSOP, EPT and WPT, the organizers will withhold a certain amount from the prizepool for tips (usually between 2% and 5%) and these contributions are used to pay each dealer. Poker dealers can earn in excess of $30-an-hour, get to sit alongside some of the top players in the world, and have an intimate insight into the game. But like with anything, there are certain things you need to watch out for so that they don't hinder your dealing experience. That's why it's always important to consider all aspects of the job before taking the plunge. As you can see, the poker industry is about a lot more than the players and becoming a dealer can be a rewarding experience (both in terms of entertainment and financially) if you're able to get the right training. Start in a small poker room to gain some valuable experience before you move to a more established venue. You don't always need training, but it helps. Focus on accuracy first and speed second. Develop a thick skin, as frustrated players may take their frustrations out on you. Be friendly and personable at all times - it makes the game more pleasant and will help you earn more tips. Don't get fixated on high stakes games, people usually tip more in those with low-to-mid stakes. Don't EO (early out - clock off early if the room is quiet) because it will inevitably get busy when you leave and you'll miss out. What does a poker dealer do? 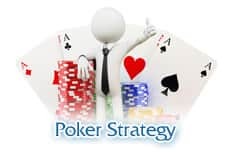 A poker dealer is responsible for keeping gameplay moving, so an expert knowledge of the game coupled with excellent mathematical and interpersonal skills are a must. As a poker dealer you'll be required to shuffle the deck, deal cards, turn over community cards, and collect folded hands as play progresses. 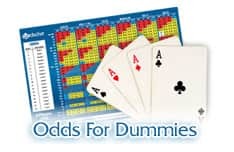 On top of this, you'll also need to keep track of the pot, announce bets and raises, quickly identify winning hands, and ensure the correct cut is retained for the house. It's a complex role that puts you at the center of the action, so a cool head and ability to remain calm under pressure are essential attributes for anyone who wants to succeed as a poker dealer. Throughout the United States the term dealer or poker dealer is used most commonly, but outside of the U.S, particularly in parts of Europe such as France and Britain, a dealer can be known as a croupier. Some U.S casinos have also adopted this term but it's less common outside of Europe. Base salaries for dealers are usually in the region of around $21,000 per year, but poker dealing is a service industry and so tips are common. This means that although your base salary is relatively low, the amount you make in tips can make a significant difference to your take home pay. 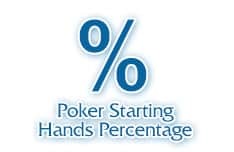 Players normally tip the dealer per hand during the game, so the more hands you can get through during your shift, the higher your percentage of tips is likely to be. It's not uncommon for experienced dealers to make up to $30 per hour in tips alone, and that's just in low stake games. For hands where the stakes are much higher, some players have been known to tip $100-$500 per hand, so it's easy to see why salaries of poker dealers can vary so dramatically from one month to the next. Obviously tips are dependent on the level of service the player feels they have received, so a professional and courteous manner will go a long way to helping you secure more tips during your shift. Do they make more in Vegas? You'd think so but no. The only way for a poker dealer to earn more is to get bigger tips. For this to occur you need to be dealing at a high stakes table and even then there's no guarantees you'll automatically be tipped well. It boils down to the attitude of the player, and how well you've impressed them. Remember, a more personable approach and professional conduct will help you on your way to better tips. Do they keep their tips? The tipping policy depends entirely on the casino you work at. Tipping a poker dealer is permitted in the U.S (it's strictly forbidden in some parts of Europe) but some casinos will allow the dealer to keep their individual tips and some operate a pooling policy, whereby all tips are collected and then split equally between the dealers working that shift. The latter approach can be less favorable if you've earned good tips but some of your colleagues haven't, as it will leave you worse off. If you're dealing in a tournament, rather than a bricks and mortar casino, then tips are normally divided between the dealers in this instance as well. How do I become a poker dealer? There are two ways you can approach this. If you're an experienced poker player who knows the game well, then you could try contacting some local casinos and enquiring about job opportunities as a dealer. They may bring you in for a live trial, which will involve you dealing in an actual game while the casino or pit manager watches you to see how you perform. If they're sufficiently satisfied with your performance they may offer you a job. The other way in is through a poker dealing academy or school whereby you'll gain recognized accreditation. This will definitely further your employment prospects as a poker dealer and is looked upon favorably by most casinos. For some it's a pre-requisite of employment. There are two main training schools that are endorsed by the industry. These are the Casino Institute and the Mizarachi Dealer Academy. All poker dealers are also required to have a gambling license by law. Typically a poker dealer will be required to wear a shirt, trousers, waistcoat, and have an overall smart appearance. The casino you are employed by will determine what you wear, and in the most instances provide you with a full uniform, though you may have to pay a deposit initially for these items. Why do they wear visors? Why do they tap the table? This is a non-verbal signal that can be detected by the casino camera's looking on who can see the action but not hear it. The timing of the knock and the number of taps will have a bearing on what the dealer is communicating. How does it compare with other casino dealer jobs? It's pretty much the same, though poker, like blackjack can have long hands so you can be sitting for large periods of time. That's also where having a passion for the game you're dealing is a benefit.